There is never a dull moment in the life of a Wooster geologist. This afternoon at the Lava Hostel, Keck students were surprised with a visit from Brian S. Carl, Wooster alumni class of ’87. Brian, now a Senior Production Geologist for Shell, stopped by after hearing word from Dr. Wilson that Wooster students were in the area doing research. Brian and his wife Karen were enjoying their their vacation in Iceland; we just missed visiting with their daughter, Alena, who is a current Wooster student. From left to right, Wooster alumni Karen Carl, Brian Carl, Meagen Pollock, and Ben Kumpf. 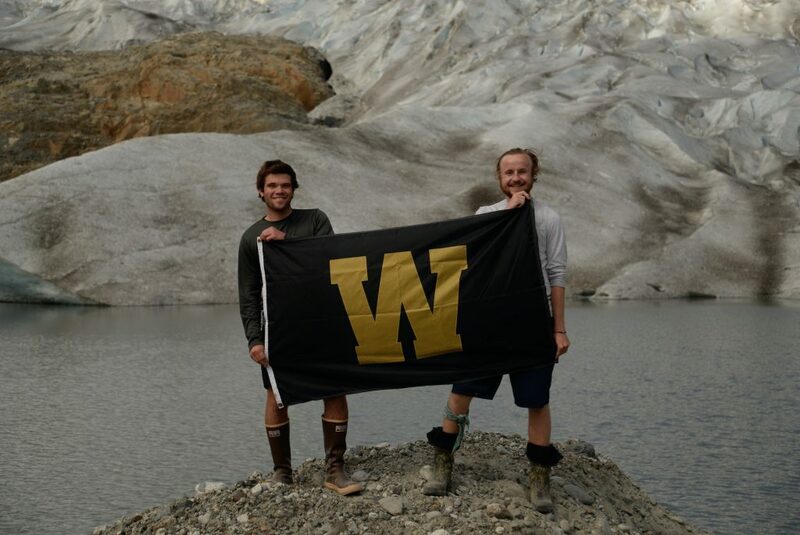 Two College of Wooster geologists in the Alaskan wilderness is always a recipe for success. Thanks to Dr. Wiles and the geo gang, we took our interests in glaciology and dendroclimatology to Glacier Bay National Park and Preserve in Southern Alaska, where scrambling up glaciers, maneuvering slippery alders, and finally sampling old growth trees became daily routine. 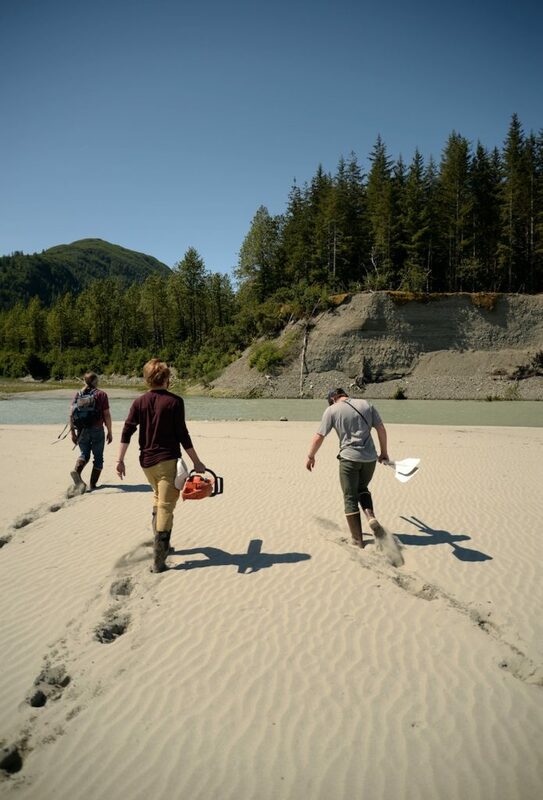 As the first time in Alaska for Andrew and the second for Jeff, the beauty of the historic place was stunning and allowed scientific inquiry to flourish in its wake. 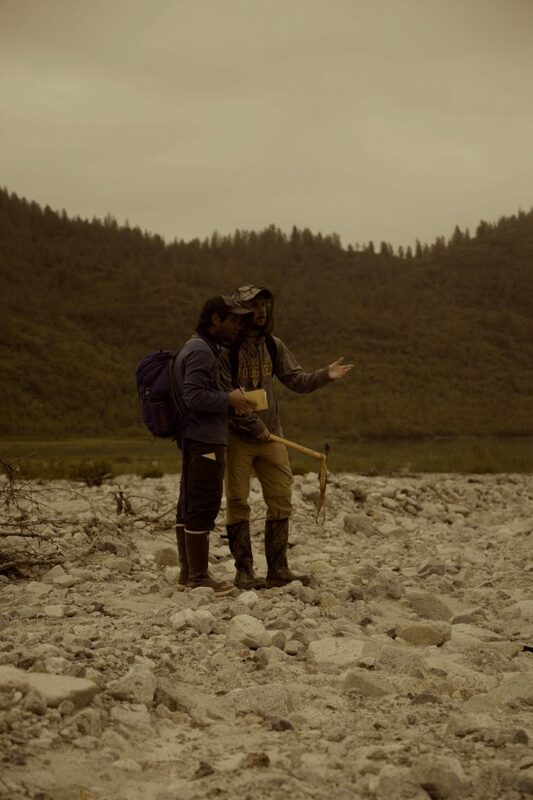 Jeff’s tall task stood as “bridging the gap” of Glacier Bay’s glacial and climate history and Andrew, an English major by night, explored the location’s history in accordance with the writing of esteemed preservationist John Muir. We were met by none other than Nick Wiesenberg at the Juneau airport, where we promptly sorted out food supplies and last minute gear checklists. After a few quick stops around town and a quiet night in the state’s capitol we were set to take off for Glacier Bay and to enter the field. We spent the night in a park-designated campsite and the next day we, as a trio, embarked a national park service boat to scoop up Dr. Wiles and his bright-eyed photographer Jesse who were already at Marble Mountain. Thereafter, we voyaged up-Bay to Muir Inlet where we set up camp between the Eastern-Arm’s McBride and Riggs Glaciers. The following day, the five of us kayaked to Wolf Lake in hopes of finding logs that would bridge the 2000-year old gap in the Glacier Bay tree-ring chronology. This totaled to a 14-mile round trip venture, where 6 miles were by foot and 8 were by kayak. 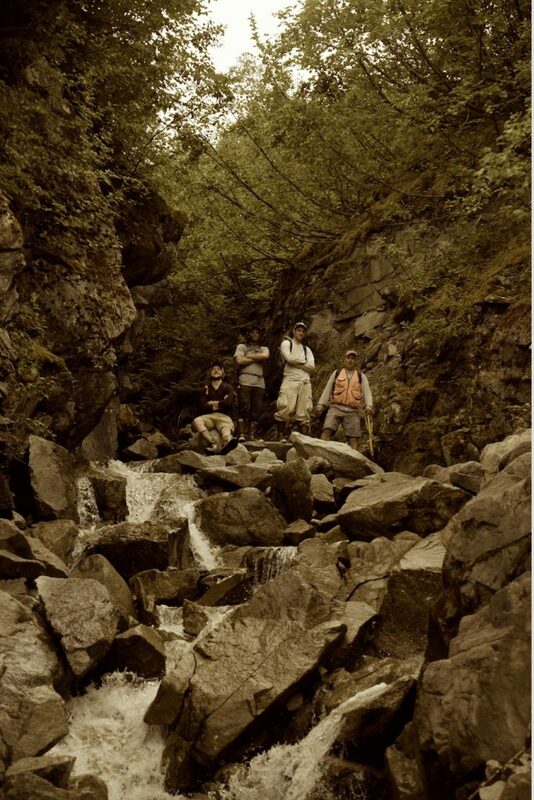 The trek followed a decent sized creek, through marshy, bug-infested alders up a ridge to a drainage divide. From the top, a beautiful lake was visible whose crystal waters contained the remnants of an icy past. Down the other side of the divide was our goal- the roaring braided streams and the encasing alluvial fans. The mosquitoes brandished whatever the hell it is that they so eagerly stab us with and we set forth, mesh bug nets swaying in the wind, serving as a sort of lifeline. At last in the outwash plain, we spread out and surveyed the area for the missing pieces to our chronological puzzle. Our efforts proved fruitful, for there was more wood than we could conceivably carry. This first day of fieldwork truly set the tone for the remainder of the project. Sunny skies would subsequently outweigh threatening thunderous clouds, and complacency would never overcome hard work. The following afternoon the crew seized the opportunity to explore McBride Glacier by sea kayak, both resting tired legs and experiencing the immensity of one of the only remaining tidewater glaciers left in the Bay. We found it incredibly rewarding and inspiring to be so close to the very living beings that we have, and indeed will continue to, spend so much time studying. That afternoon, ice appeared the most brilliant shade of blue. Later that night, rice and beans never tasted so good. 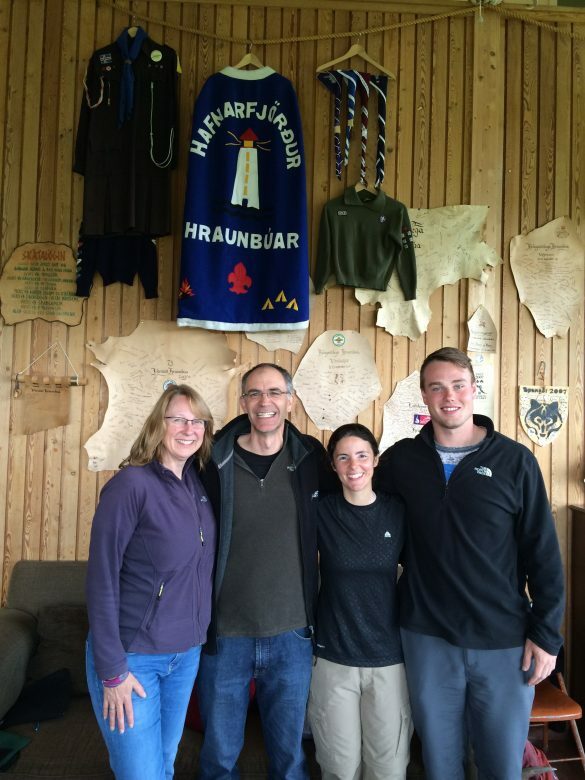 Hafnafjörður, Iceland – Cara Lembo (Amherst), official Keck Iceland 2016 Guest Blogger. Greetings from rainy Iceland! 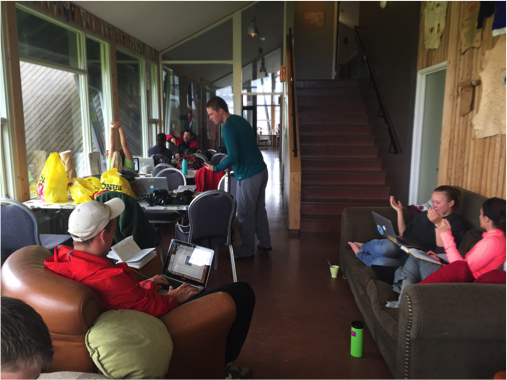 After spending 4 full days in the field we are spending a rainy day inside discussing projects and compiling our data. Inside the Lava Hostel on a rainy Sunday morning. 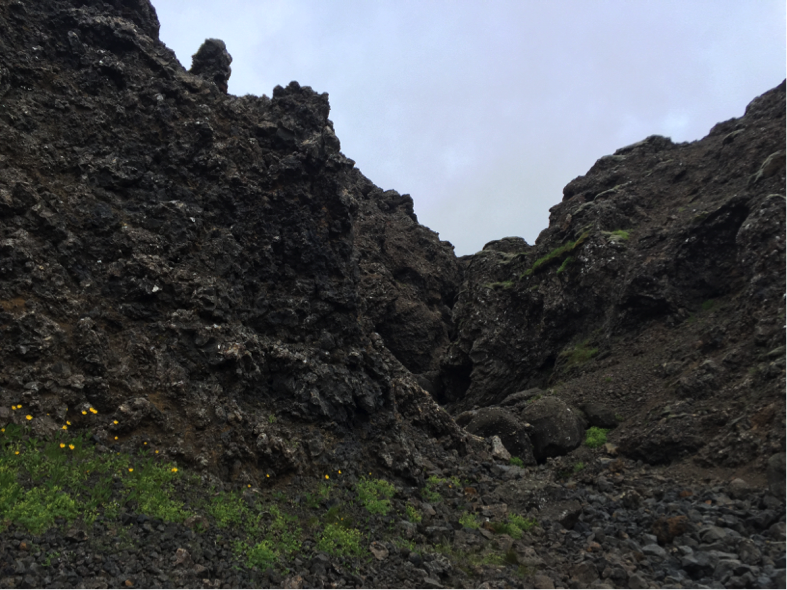 We spent our first day and a half in Iceland inside the Undirhlíðar quarry – an ideal place to observe cross sections of pillow lavas and other volcanic deposits. 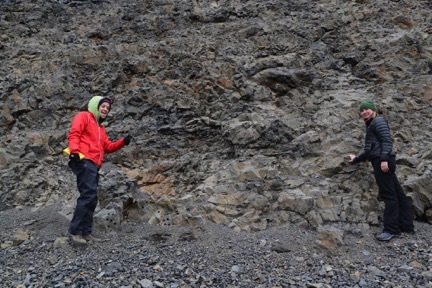 Michelle Orden (Dickinson) and Anna Thompson (Carleton) with a shelved lava tube in the Undirhlíðar quarry. The tube was likely refilled with the darker lava. 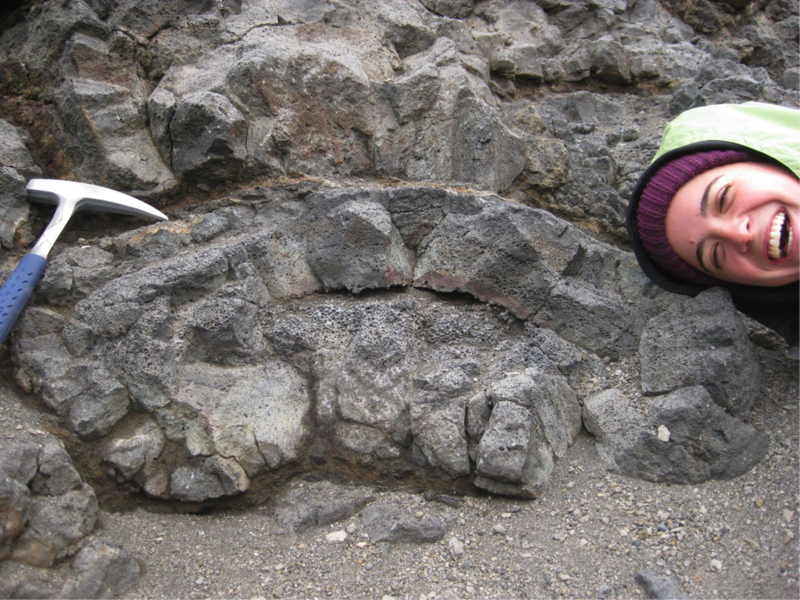 A pillow in the Undirhlíðar quarry. Keck students hiking across the ridge. Students and Ben observing a diamict deposit on the ridge. Once we surveyed the whole ridge, we started our mapping project with a gully on the southwest side of the ridge. The gully we mapped. We discovered lots of fractured pillow lavas and dikes. Michelle looking for trolls in the lava field below the gully (the trolls we are looking for). 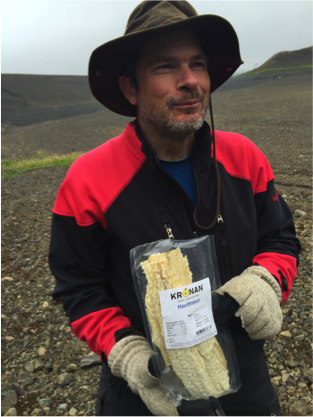 We’ve also sampled some local Icelandic cuisine such as Skyr, chocolate covered licorice and, to Dr. Pollock’s dismay, Harðfiskur (dried fish). Ben with Harðfiskur. The dried fish has an incredibly potent smell that we cannot get out of the van. Overall it has been an exciting first week in the field. More to come as we continue working in the field and trying to adjust to the never-ending daylight. Hafnafjörður, Iceland – What a fantastic day! 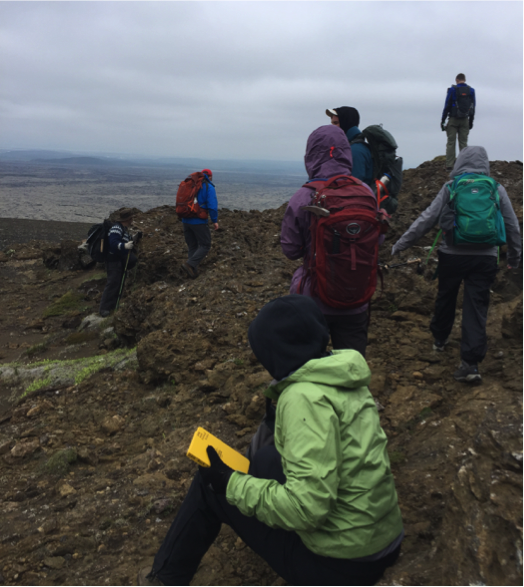 Dr. Ben Edwards and I are leading a 6-student Keck trip to Iceland to study a glaciovolcanic ridge. It was a long travel day, but everyone (and their luggage) arrived safe and sound. No need to waste any time – soon after we set up camp, we headed to the field. 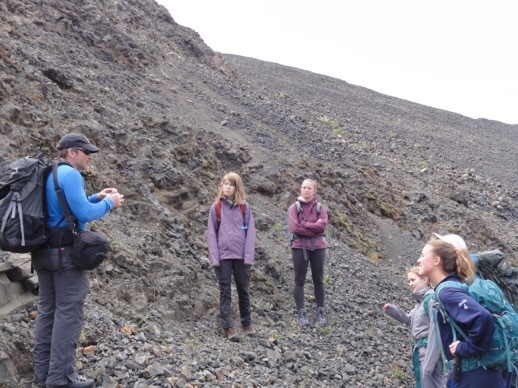 Ben Edwards (left) and the Keck students discuss their initial observations of pillow lavas and dikes. 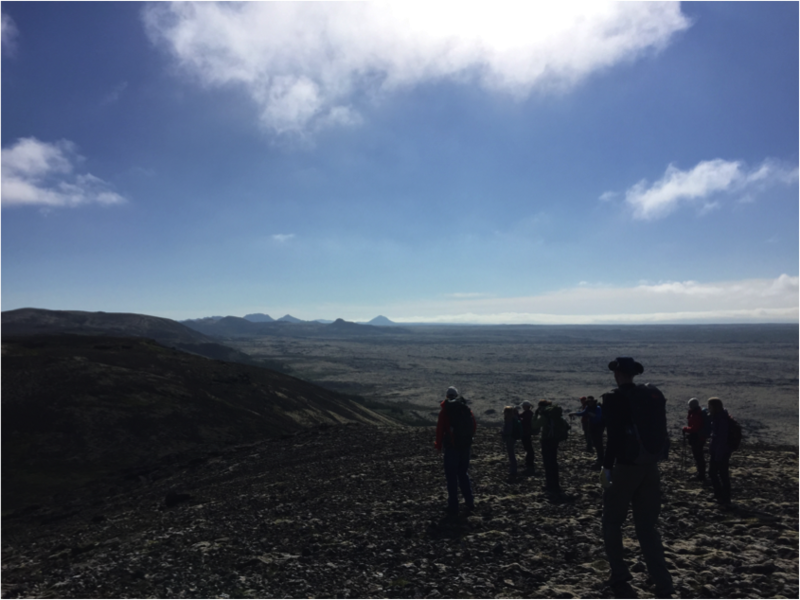 A beautiful day welcomed us to our field site, but we couldn’t stay for too long because we had a birthday to celebrate. 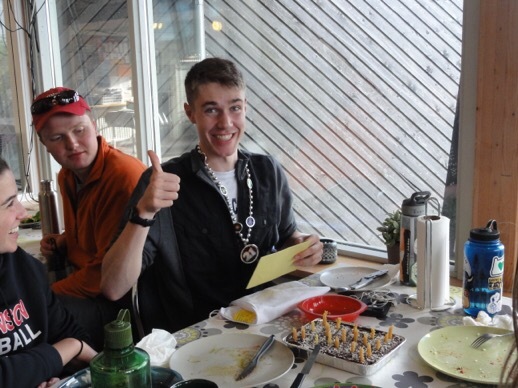 Carl-Lars celebrated his birthday today during his first visit to Iceland, among his newfound Keck friends. Today’s introduction was brief, but we’ll continue to post about our work and adventures over the next month. Wooster Geologist high in the air! 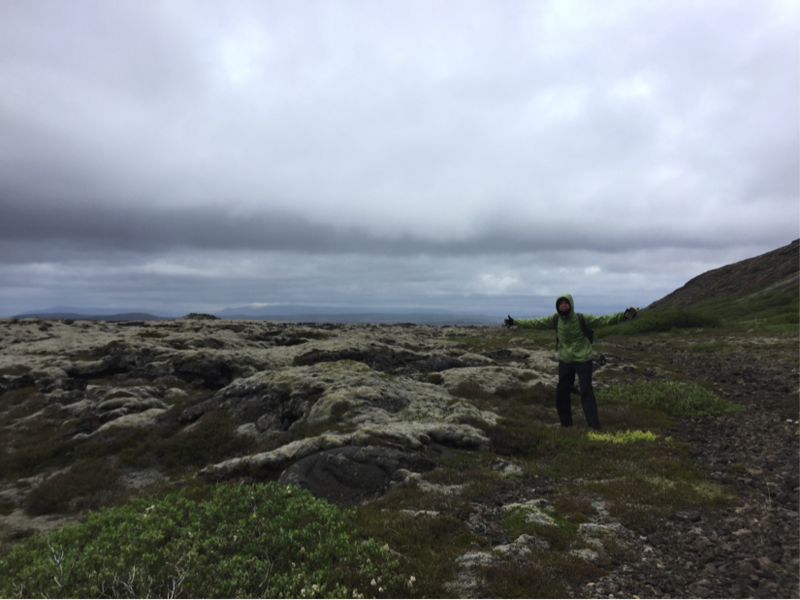 Editor’s note: The following post is from guest blogger Annette Hilton (’17) about her extraordinary research experiences this summer. Annette gets around: You may remember her post last summer from the American Museum of Natural History. 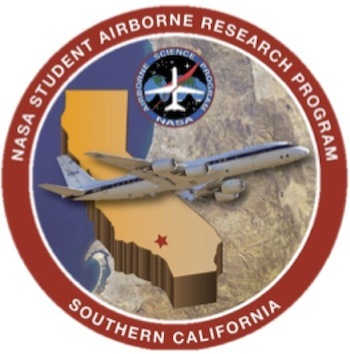 This summer I have the privilege of working an REU (Research Experience for Undergraduates) internship with NASA Student Airborne Research Program (NASA SARP). 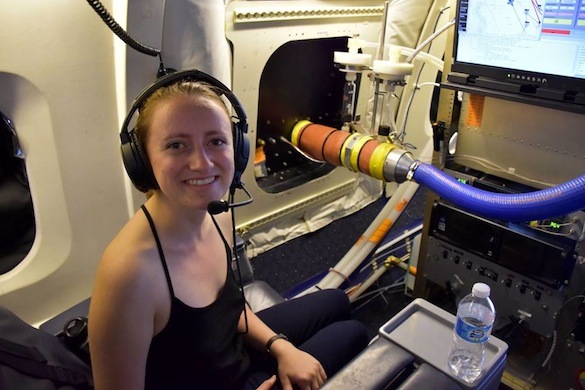 The program has employed 32 undergraduates from all over the United States to explore airborne Earth science with four amazing mentors, all associated with NASA and universities from around the USA. 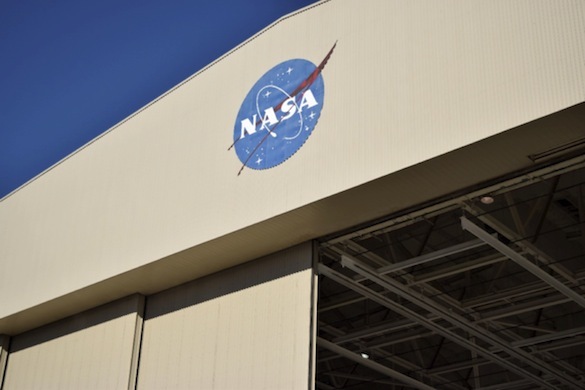 The program takes place in southern California—the first week spent in Palmdale, CA, where the NASA Armstrong Flight Research Center is located. 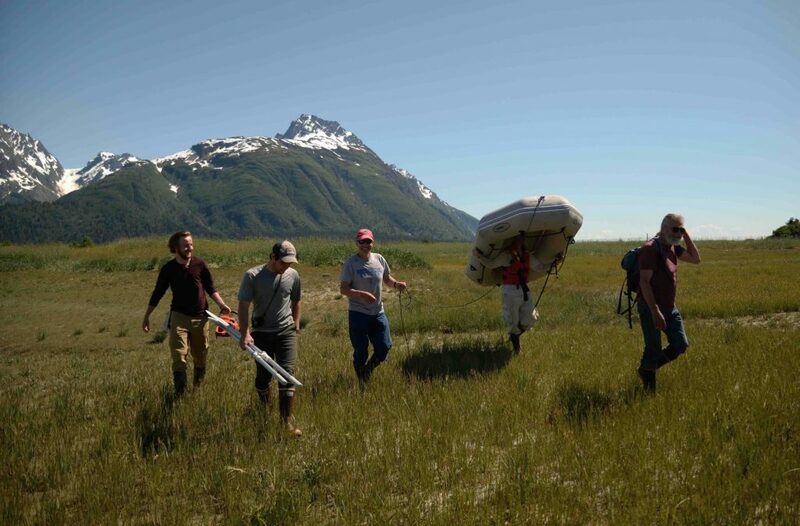 The second week SARP is split into four teams of eight students for specific research areas—Coastal Ocean and Remote Sensing, Forest and Remote Sensing, Atmospheric Chemistry, and Whole Air Sampling—and team field trips. The remaining six weeks will be spent in Irvine, on the UC Irvine campus, for data analysis. Figure 1. Armstrong Flight Research Center, where all of NASA’s Earth Science airborne campaigns take place. The hangar pictured above houses several planes, including the DC-8. 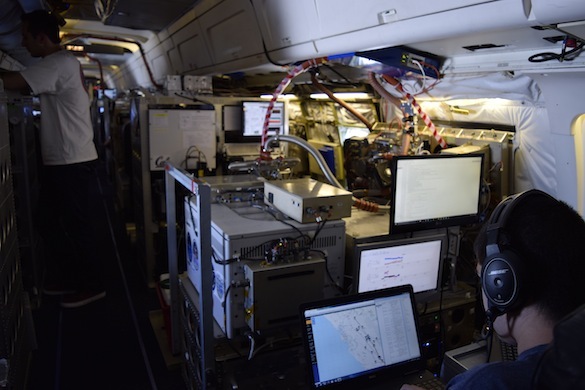 SARP flies two missions on board the DC-8, NASA’s airborne laboratory. 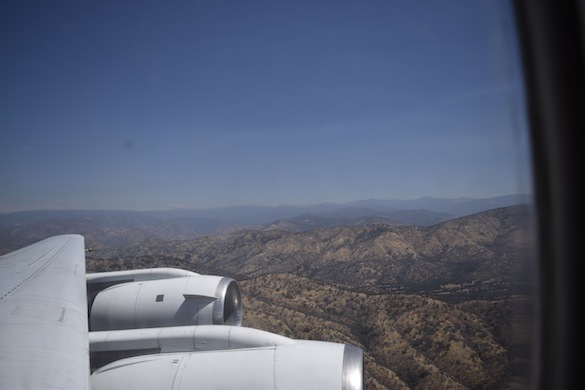 On Saturday June 18th I flew on board the DC-8 for a six hour flight over the Central Valley and Santa Barbara Channel. Figure 2. Map of flight plan for the DC-8 on June 18th. The red circle indicates an area we had to unexpectedly plan around, as President Obama was camping with his family in Yosemite. This map does not include our added flight path above the Santa Barbara channel. Figure 3. 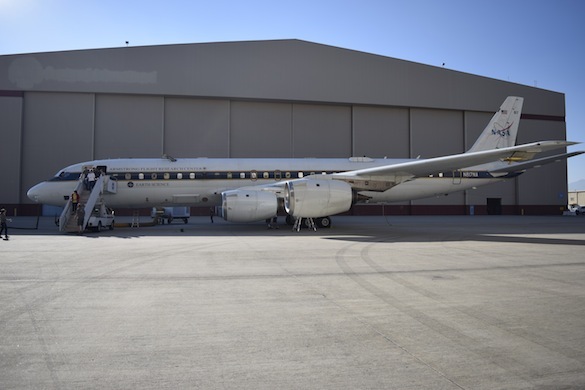 The DC-8 outside the hangar at NASA Armstrong Flight Research Center. Figure 4. 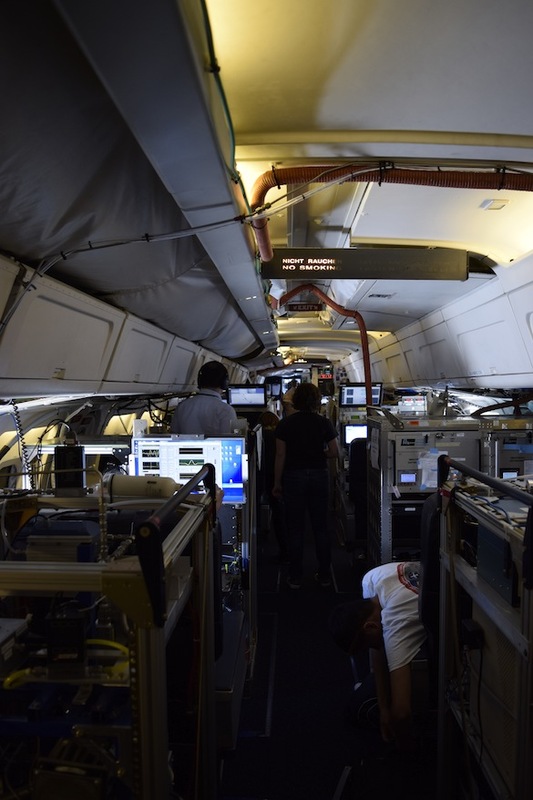 As you can see, the plane has been heavily modified for all the scientific equipment it houses! Most instruments on board sample and analyze data real time. Figure 5. Inside the DC-8. The aircraft had just returned from a six week mission in South Korea, called KORUS-AQ, an international cooperative air quality field study. Because of this, the DC-8 was decked out with all the KORUS-AQ instruments, which SARP was able to have access to! When I was on board there were at least 40 different instruments, as well as most of the KORUS-AQ team. Figure 6. More scientific goodies! During the six hour flight we primarily flew in the Planetary Boundary Layer (PBL) (~1000-4000 ft altitude) in order to be close to emissions over the Central Valley. Our flight plan included flyovers of large dairy farms, oil fields, agricultural fields, and the Santa Barbara channel. 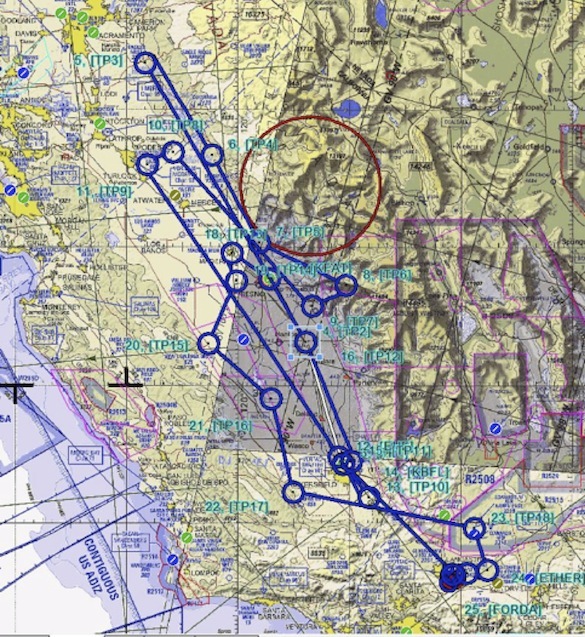 We flew a few missed approaches where we got to about 40 feet above ground before flying back up to the PBL in areas of particular interest as well as a vertical spiral to create a profile of the atmosphere. I was even able to ride for 20 minutes in the cockpit and speak briefly with the pilots! 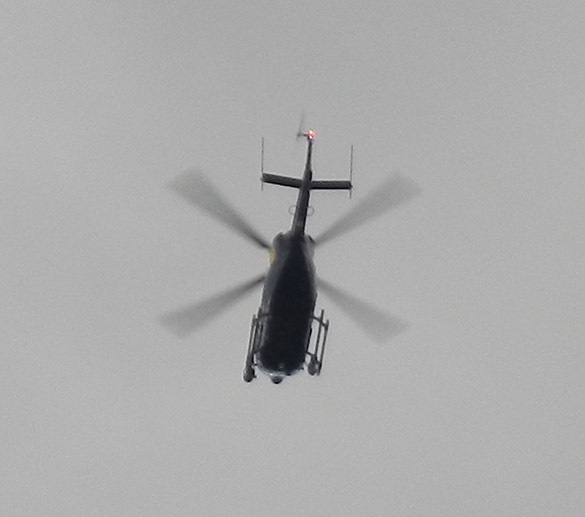 Luckily, I was not one of the students on board who became ill during the flight. Flying in the PBL is very hot and a bumpy ride! Figure 7. Outside my window in the PBL over the Central Valley. Figure 8. Outside my window over the Santa Barbara channel, in smoke from the Sherpa Wildfire. 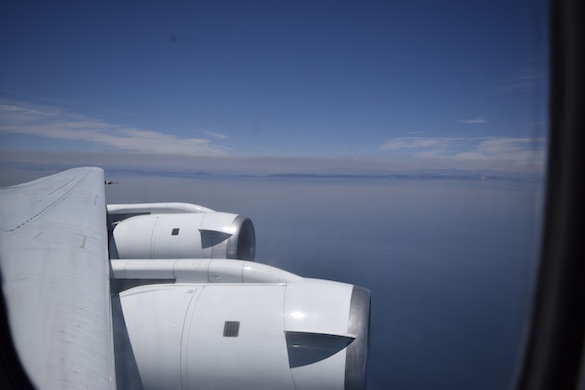 The first SARP flight on June 17th flew over the Los Angeles Basin. 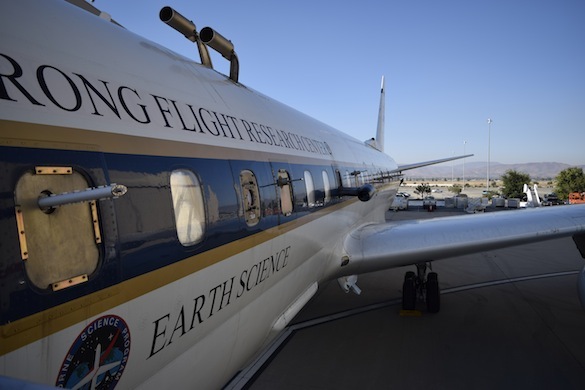 In addition, SARP has access to another one of NASA’s planes, the ER-2 (a pilot only plane), which will fly two missions for SARP above the same areas the DC-8 flew in order to obtain high altitude data (the ER-2 can fly up to 70,000 ft). SARP will also have access to the data obtained during the KORUS-AQ mission, as well as ground-based data during the second week field trips. My group, Coastal Ocean and Remote Sensing, will be traveling to Santa Barbara for a day cruise out on the channel to collect water samples. These data will eventually be used to calibrate and validate both airborne and satellite data obtained during SARP over the coastal area. Figure 9. 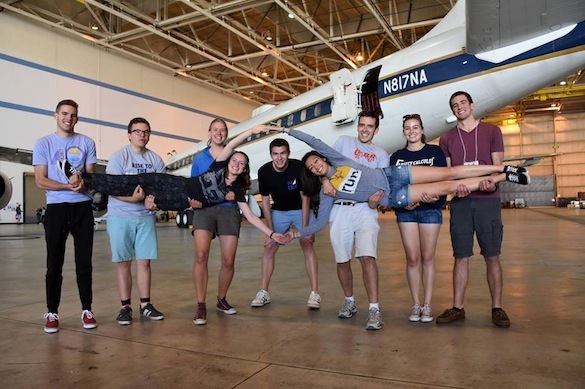 The Coastal Ocean and Remote Sensing group in front of the DC-8. I am very excited to be in California this summer working with a wonderful group of peers and mentors at SARP. SARP has access to a plethora of data which I will utilize to design my own research project for the summer, which I also hope to continue during my senior independent study at Wooster. A shout out to all the wonderful professors in the Wooster Geology Department who I owe many thanks to for their help in being able to participate in such an amazing experience! Thank you for all you do. 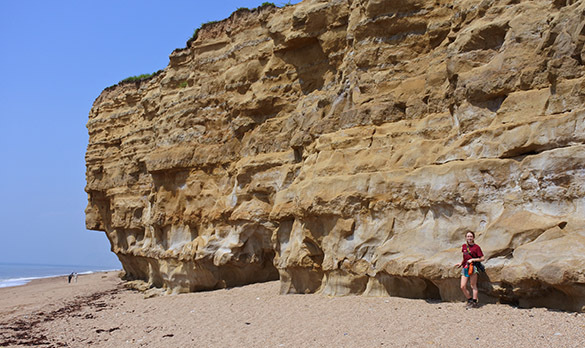 Cassidy Jester (’17) and I have now finished our fieldwork in southern England this month. 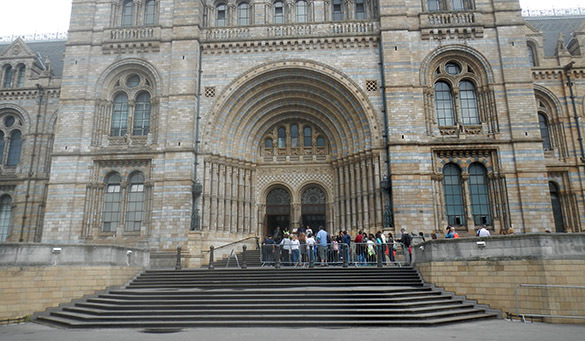 Cassidy traveled through Britain afterwards, and I went on to London and the Natural History Museum. It was all a success thanks to my friends and colleagues Tim Palmer and Paul Taylor, with critical help from our new friends Bob Chandler and John Whicher. Our daily blog entries can be accessed at the UK2016 tag. 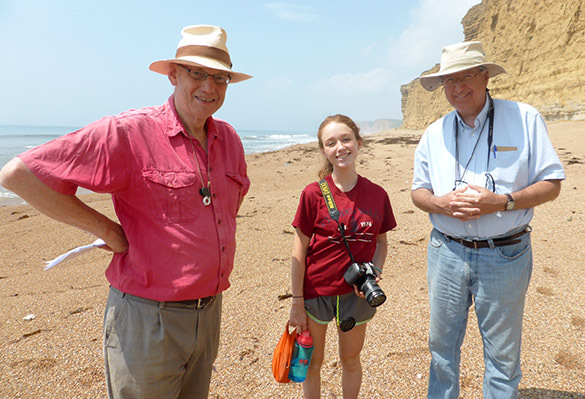 Tim Palmer, Cassidy Jester (’17) and Mark Wilson on Hive Beach, Burton Bradstock, Dorset, England. London, England — My last day in London was spent working on GSA abstracts and examining one last ferruginous oncoid (“snuff-box”) from the Jurassic (Bajocian) of southern England. Bob Chandler donated to the cause a large discoidal snuff-box. We cut it (cross-section through the center shown above) and revealed its intricate internal structure. 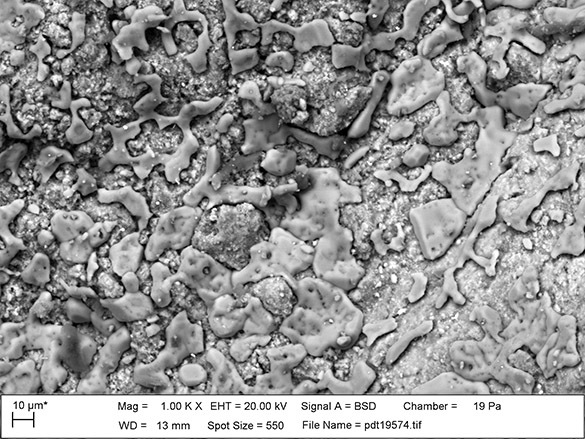 The typical limestone nucleus is smaller than I expected, but it still shows typical features such as bioerosion. This specimen has beautifully-developed “horns” around the periphery. 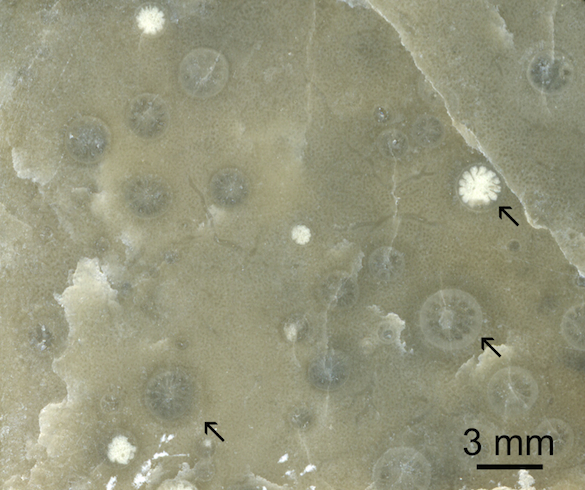 They are made of laminae not connected to the central cortex. Paul Taylor suggested that they form when the snuff-box is no long being moved about. Nice specimen. Cassidy Jester (’17) will have much to figure out in her Independent Study focused on these objects. I’ve had a great and productive time on this expedition to England. Thank you again to my amigos Tim Palmer and Paul Taylor, as well as John Whicher, Bob Chandler and Consuelo Sendino. Science marches on. 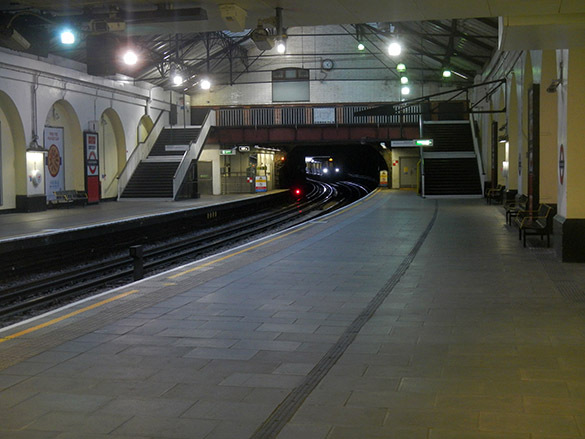 Addendum: This is the way I like my Tube stations — empty! Take me home, District Line to Paddington. Saturday, June 18, 5:08 a.m. This week’s fossils are from work Olev Vinn (University of Tartu, Estonia) and I did last summer that is soon to appear in the journal Lethaia. (An early electronic version of the manuscript has been available since November.) After numerous smaller studies describing symbiotic relationships recorded in Silurian fossils in the paleocontinent Baltica, we wrote a summary paper under Olev’s leadership. All the images are take by Olev and in the paper itself. I love this kind of study because it is about fossils as living, interacting organisms, not just static sets of characteristics. 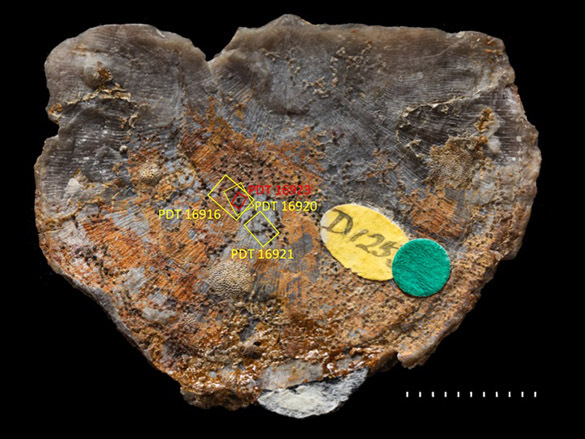 For example, the top image is of the stromatoporoid Ecclimadictyon astrolaxum (a kind of hard sponge) with embedded rugosan corals (Palaeophyllum, with arrows) from the Jaagarahu Formation (Sheinwoodian) exposed at Abula cliff, Saaremaa Island, Estonia. The stromatoporoid and corals were growing together, each having their particular needs met and maybe even enhanced by the other. 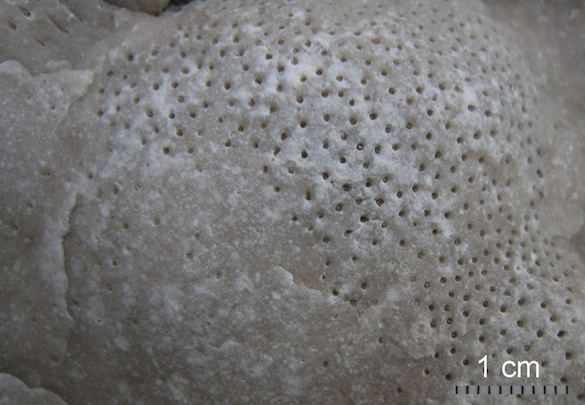 The network of holes in this stromatoporoid from the Paadla Formation (Ludfordian) of Katri cliff, Saaremaa, represent the corallites of a syringoporid coral. Again, the coral and sponge formed an intergrown association. 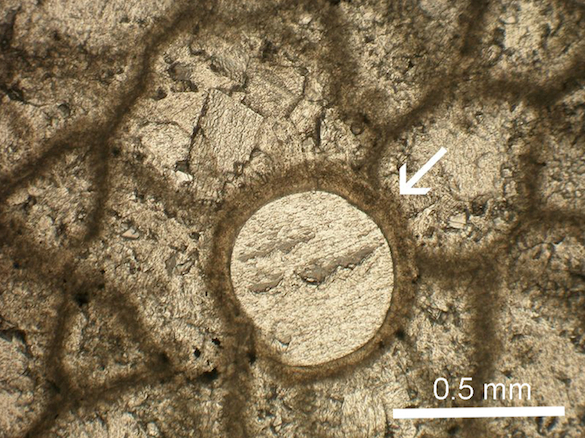 This is a thin-section view of what was likely a soft-bodied worm (represented by Chaetosalpinx sibiriensis, noted by a white arrow) embedded in the tabulate coral Paleofavosites cf. 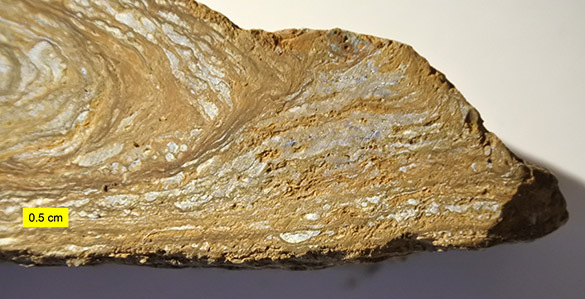 collatatus from the Muksha Subformation (Homerian), Bagovitsa A, Podolia, Ukraine. Again, the worm was embedded in the living tissues of the host. We found 13 such symbiotic associations in the Silurian of Baltica. Most of these interactions involved large skeletal organisms like stromatoporoids and corals, which provided stable hosts for smaller sessile filter-feeders and micro-predators. This work is part of a larger study looking at evolutionary trends in symbiotic associations during the Paleozoic. Vinn, O. and Wilson, M.A. 2016. Symbiotic interactions in the Silurian of Baltica. Lethaia 49: 413–420. Vinn, O., Wilson, M.A. and Motus, M.-A. 2014. 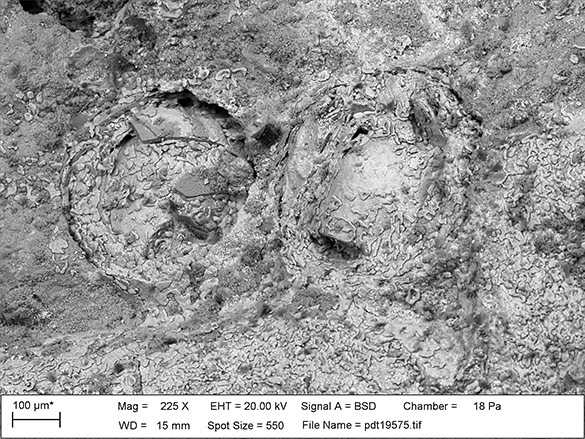 Symbiotic endobiont biofacies in the Silurian of Baltica. Palaeogeography, Palaeoclimatology, Palaeoecology 404: 24–29. 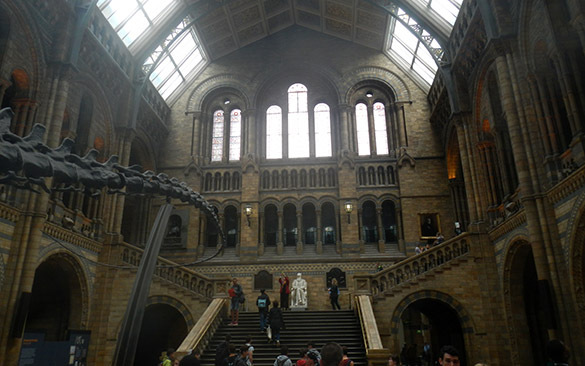 London, England — If any center of scientific research can be sacred, the Natural History Museum of London is a holy of holies for paleontology. Its deep history, highly skilled researchers and staff, and magnificent architecture makes it a very special place. As I wrote before, it is a secular cathedral of science, particularly life science. It is no accident the design of this building reflects a place of worship. Who do you think the white figure on the raised platform in the center is? He might as well be sitting on the altar. Of course! 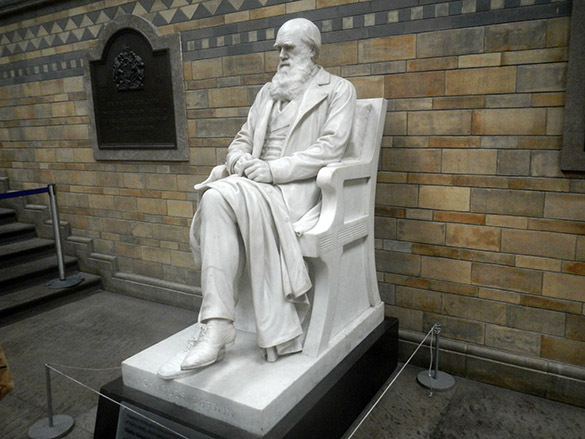 A portrait on Darwin’s upper left, not visible here and probably rarely noticed, is of his colleague Alfred Russel Wallace. 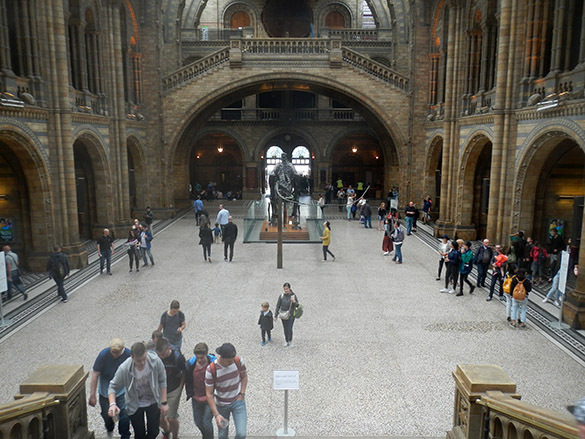 This is Darwin’s view of the main hall and entrance of the museum. Six million visitors per year pass under his gaze. 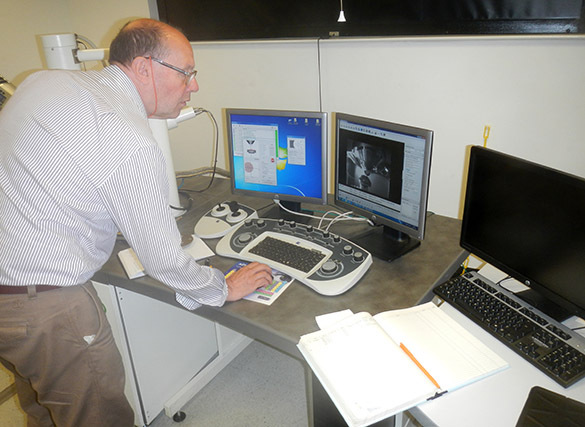 This morning Paul and I worked with a scanning electron microscope to study particular fossils we had set aside for closer examination. Paul is the best scanning electron microscopist I have met. This is the open stage and chamber of the SEM, with a brachiopod fixed in place by Paul for scanning. 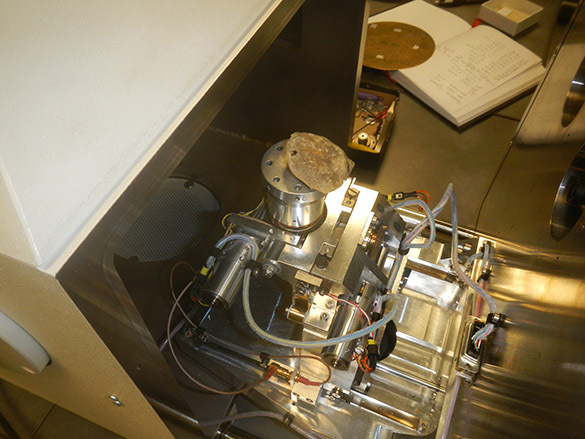 It is a complicated apparatus that can move the specimen in almost all directions in a vacuum under the electron beam. 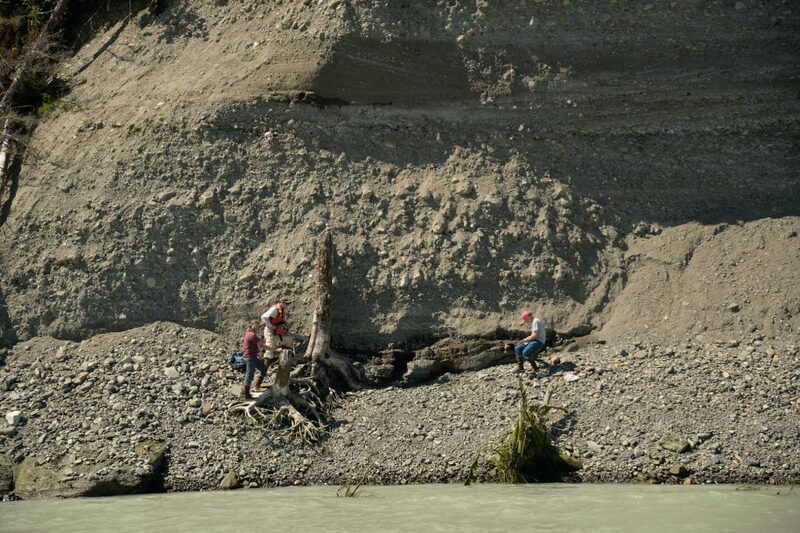 The first specimen we worked with was one of the Jurassic snuff-boxes. This is part of Cassidy Jester’s Independent Study project and her continuing research with Tim Palmer and me. Paul and I are mystified by the pattern we see here in the cortex of the snuff-box. These are two ferruginous ooids embedded in the cortex of the snuff-box. They show exactly the same mysterious irregular platy objects. 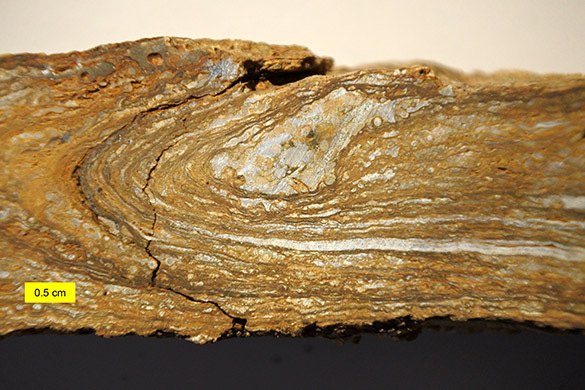 Tim Palmer suggests they may be limonite, which is amorphous (without crystals). We’ll test that idea later with mineralogical and elemental analysis. 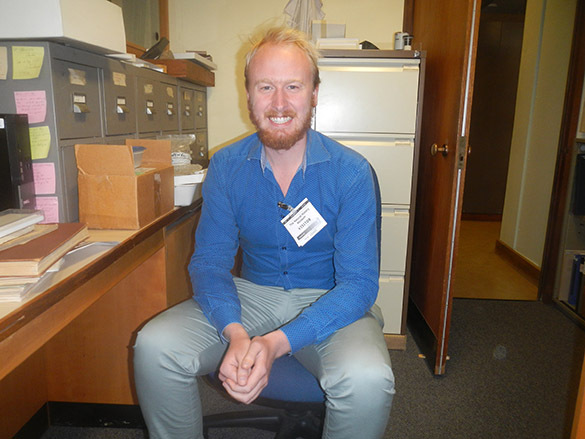 I was delighted to see my friend Jeffrey Thompson in the palaeontology section doing research for his dissertation at the University of Southern California. He made an earlier appearance in this blog when he was just a kid. 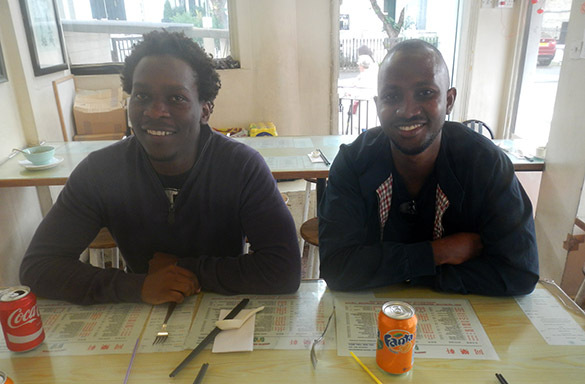 For lunch I met my former student and veteran of an Independent Study field trip to Israel Oscar Mmari (on the left) and fellow Wooster graduate Jubilate Lema on the right. Both of these young Tanzanians are now making their way in the world. Oscar starts this fall at Imperial College, and Jubilate is an economist working with an investment firm in Johannesburg, South Africa. We had a delightful meal and walk around the museum neighborhood. My long day ended with an excellent dinner with Paul and Patricia Taylor at the Swan Restaurant along the Thames River. This was our view from the table. This will all seem a dream in just two days time. 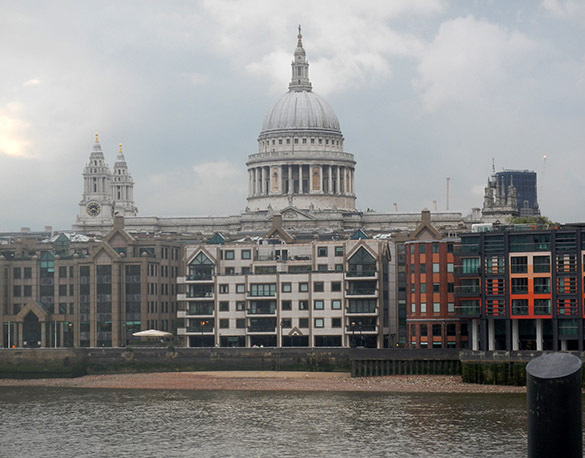 London, England — I spent most of my museum time today at a keyboard, but in a splendid and collegial setting. Very productive and stimulating conversations with Paul Taylor and Consuelo Sendino, but mostly screen time. I drew little map boxes on a brachiopod, for example, as shown above. 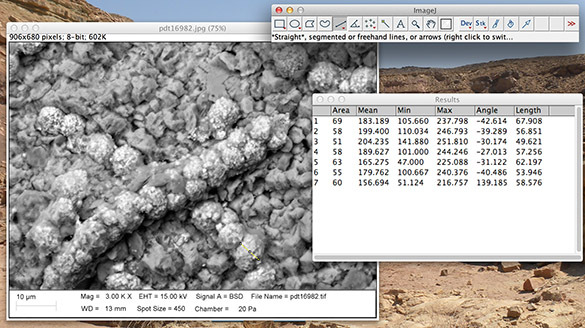 I also used Image J to measure cell sizes, as shown in the above screen shot. More on what this is about tomorrow. 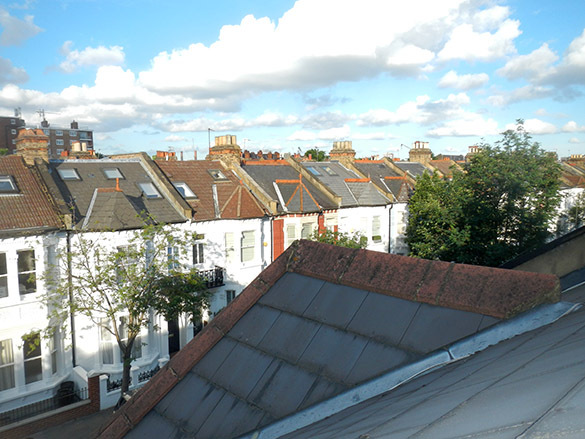 Finally, I thought I’d share the view from my attic window of Winchendon Street. I think I hear and see every flight in and out of Heathrow!